As you consider preschool choices, you should realize that you have been homeschooling since the day your child was born, and you can continue to teach your preschooler from home! 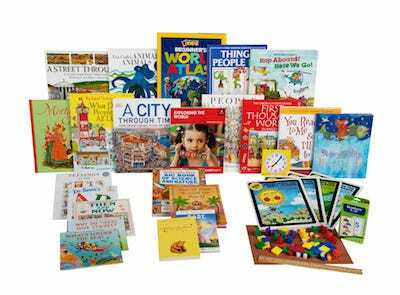 BookShark offers a fun, well-planned preschool homeschool curriculum that will provide readiness skills while introducing your child to world cultures, math, science and language arts. Our preschool program was developed for students ages 4-5 and provides an excellent opportunity to test homeschooling before deciding whether to send your child to kindergarten or to continue down the homeschooling path. You will spend roughly an hour each day with engaging read-aloud stories, picture-filled science and culture books, hands on math manipulatives and a colorful atlas. Our readiness skills books cover Motor, Visual, Auditory and Comprehension skills that will prepare your child for kindergarten at home or in a formal classroom setting.